Use this tool to visualise published reports of poor-quality antimalarials. Dropdown boxes in the left column allow the user to filter data by – antimalarial type, report type, collection method, quality classification (e.g. falsified, sub-standard), and medicine source (e.g. hospital pharmacy, private clinic) (see ‘Methodology’ for definitions). A slider under the map selects articles published in a defined year range. Pins mark each country or location with antimalarial quality data. Click a pin to see the type of publication, summary results, collection area and type, medicine source, publication title and link to the article, if open access. Pin colour represents the maximum medicine failure rate reported in the survey. Any other medicines collected will have a lower failure rate. Click on the article title to view the associated publication, if open access. A table with the selected report will appear below the map. A list of all the published reports providing data or information related to poor quality antimalarials. Click to sort by first author, year of publication, title, name of publication or country in which the study took place. 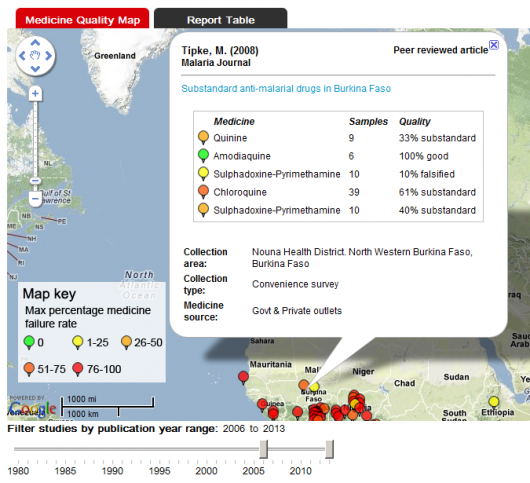 Reports not related to a particular location, for example those pertaining to sampling and analysis techniques, drug legislation and reviews, are found in the report table but are not on the Medicine Quality map. These reports are easily found by filtering the 'Country' column.